Microsoft plans to improve the user experience during setup of Windows 10 in regards to error messages the system may display in the coming Windows 10 version 1903. The company demonstrated the current and new functionality in the latest Windows Insider Webcast on Mixer (starts at the 1 hour mark). The company acknowledged that the current system is not well suited to provide users who are not very tech savvy with needed information to fix issues encountered during setup (or upgrade). 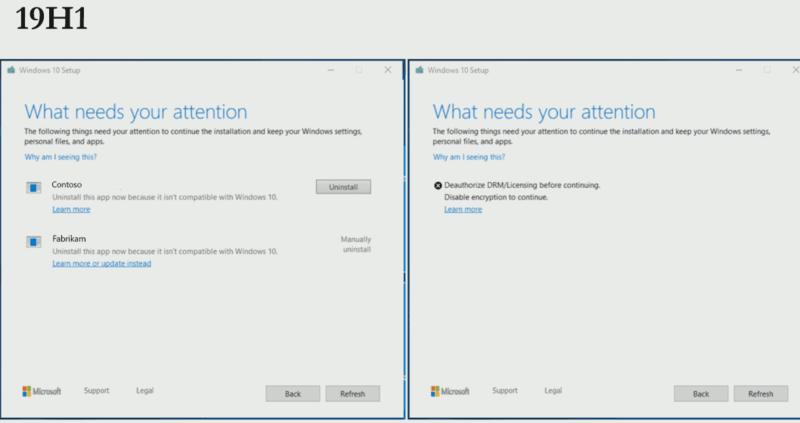 Current versions of Windows 10 may display a Knowledgebase ID but it is not linked and customers may not know what to do with it other than to provide it when they contact IT support or Microsoft. The only actionable options are to go back and end setup or to refresh; refresh won't change anything, however, until the software is either removed or, if possible, updated. The next feature update introduces changes to the setup process to make error messages less cryptic and provide users with better information and actions to address the issue directly. Make sure that KB articles are linked so that they may be opened directly. Provide users with an option to learn more about the issue. 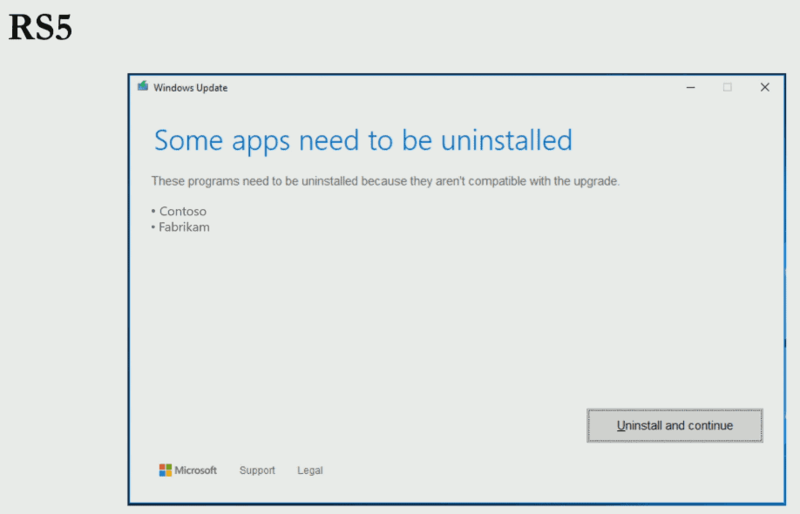 The following screenshot shows a Windows Update error message that prompts the user to remove certain applications in current versions of Windows 10. The interface provides little information other than that Windows compatibility found these apps to be incompatible with a newer version of Windows. The only options that users have is to uninstall the listed programs to continue, or close the dialog. The updated dialog for the same issue provides users with more information. It adds icons to each application, includes a "learn more" link for each application, and options for each of the listed applications. For some applications, Windows may hint that users may be able to update the application instead to resolve the issue. 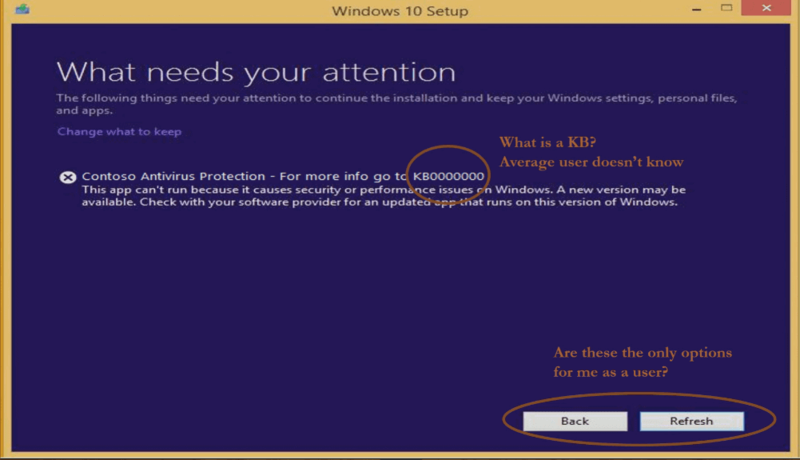 Also, there is a link to general information about the issue which links to a KB support article, and options to go back or refresh the dialog. Microsoft has to find answers to some questions that are not addressed yet. It is not clear right now how Microsoft can provide information to offline devices. Most users should welcome the changes as they improve the setup experience. Users may find actionable options in setup and may look up information directly without having to leave the setup interface or use a different device for research. Microsoft plans to improve the user experience during setup of Windows 10 in regards to error messages the system may display. In previous versions of Windows, event log details included a link called “Event Log OnLine Help”. It took you to an explanation and a potential solution in MOST cases. With Windows 10, the link only uploads some data to MS and then dumps you on their support page. This has happened with every issue I have tried to resolve. Windows 10 is still so ugly. It keeps looking like beta for Windows 3.11 even after 4 years of existence. They need to dedicate a whole team to make the UI beautiful like Vista and 7.
if you just care for ui, there are lot of 3rd party Free apps, which can turns windows into eye candy but thats not windows is all about. How about just don’t have setup errors? Duh. Love how that error page says to disable encryption before proceeding. Like wtf? Some encryption programs are not compatible with upgrades to new feature versions. VeraCrypt introduced support for that only recently, others don’t support it which means that upgrades cannot be applied. Microsoft should run a full image backup as part of the setup/upgrade. Most home users don’t take any backups. 20+ years in making, Windows still doesn’t have built in backup function. Android and IOS already have this why Windows can’t do it as well? How android and iOS have this? Unless the explanations of KB’s are less cryptic/generic and support more sophisticated than “Reinstall Windows 10” or “Your application is not compatible with Windows 10, use Windows Defender Whatever…” I’m taking the article title (No offense intended to Martin!) to mean MS has improved their ability to make even more errors even faster than before. Their support forums have been awful for years; the few solutions there mostly come from users. It seems every update is either a fix for a ostensibly catastrophic security issue or a patch for yet another MS blunder. Anything to reset your OS to spy mode for no good reason. Windows 10 1903 comes with setup error improvements. I didn’t think we needed improvements with the errors, they are bad enough already!! !